Would you like to find out how many people lived in Ercolano? With Ercolano Tour you can discover a charming ancient place still able to surprise was brought to light after centuries of darkness. This little city had and to its nearby city, Pompei, shared a similar story. They were both buried during the Mt Vesuvio eruption in 79 A.D. This fact allows us to currently visit these intact places, to see a shop or a area designed to entertain and imagine how life was lived during those times. Watch the clues closely, find your orientation, follow the tracked indications on the map directly on your reference book, search carefully around you. Who is going to be the first one able to spot the trail clues? Challenge other participants, let yourself be lead and immersed in the historical framework and in the interesting stories each clue is linked to. 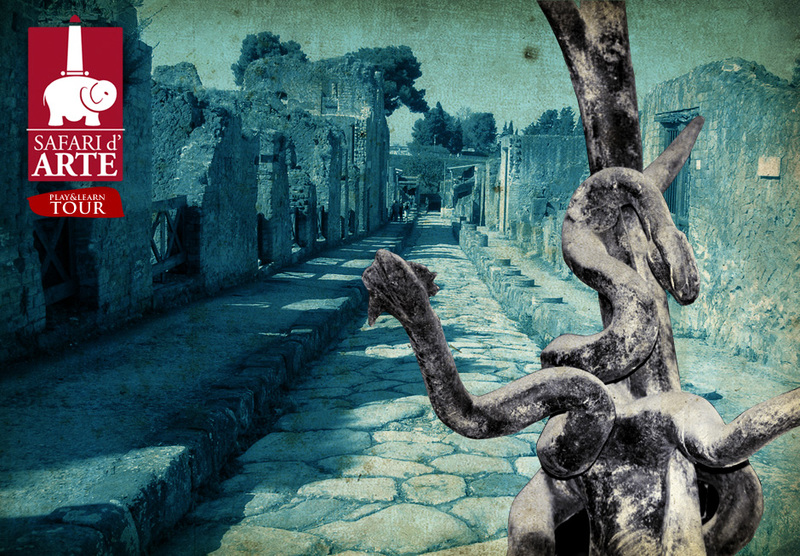 Become a real art treasure hunter with Ercolano Tour! Test yourself, play the game with your friends and other participants, then take the final quiz! This what you can experience by choosing Safari d’arte Ercolano Tour Play&learn tour!